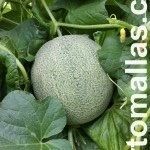 Melon Photos Gallery - HORTOMALLAS™, supporting your crop. Use these ideas to improve your melon crop productivity using trellis net as crop support. The great advantage of using HORTOMALLAS netting for your tutoring of cucurbitaceae plants is an improved phytosanitary conditions, thanks to improved aeration and decreased contact with the workers´ hands, as these are a vector for disease transmission and mechanical stress. HORTOMALLAS is the most used melon trellis net available on the market because of its ease of use and durability (it lasts many cycles therefore allowing its already low cost to be distributed over many crops, also allowing crop rotation). Melons are traditionally grown on the ground with very wide distances in between furrows, on sandy soils with lots of water available. By trellising melons instead of growing them on the ground the quality improves as there will be an increased air flow that will reduce mildew and other humidity driven pathogens, as well as there will be less damage to flowers and buds due to workers crushing them while walking to do their assigned jobs. In this link you may find a study done by the Autonomous University of Sinaloa comparing raffia and trellising net and how they affected yields in melon crops in a greenhouse.